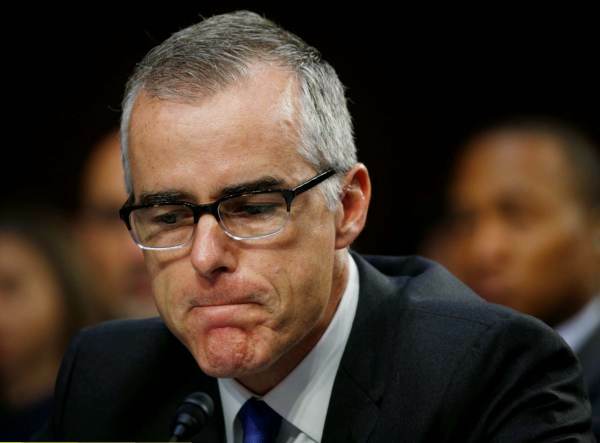 The communications in question are related to McCabe’s wife’s unsuccessful run for Virginia State senate and might also contain invaluable information on McCabe’s role in the Bureau’s investigation into Hillary Clinton’s private email server used to send classified information, several former FBI sources and a government official told this reporter. In January, Judicial Watch, a formidable conservative watchdog group based in Washington D.C., filed a lawsuit against the FBI for the communications on behalf of retired FBI Supervisory Special Agent Jeff Danik. Danik spent more than 28 years with the bureau as a supervisor in the counter-terrorism division and special overseas advisor. Danik filed his original Freedom of Information Act (FOIA) request in October 2016 for McCabe’s communications. A day after the New York Times reported FBI Director Christopher Wray confronted McCabe over unspecified findings in DOJ Inspector General Michael Horowitz’s report, the Washington Post reveals the embattled bureau official is being probed over his role in examining emails found on former Rep. Anthony Weiner’s laptop. Former Secret Service agent Dan Bongino has hinted to his nearly 320,000-strong Twitter followers that the next bombshell to drop could involve McCabe’s mishandling of classified information. “Here’s the next shoe to drop -> was Andy McCabe using secure comms to send/receive classified information? Someone should check on that,” tweeted Bongino. Here’s the next shoe to drop -> was Andy McCabe using secure comms to send/receive classified information? Someone should check on that. McCabe stepped down January 29th, as first reported by NBC News. McCabe, who served a brief stint as acting director of the bureau, was already expected to leave. He will stay on “terminal leave” until he is eligible to retire with benefits in March,” reports CNBC.